This is the new Norton V4 racer that will race at this year’s Senior TT, and you can read the full inside story of the bike in the latest issue of MCN, on sale now. 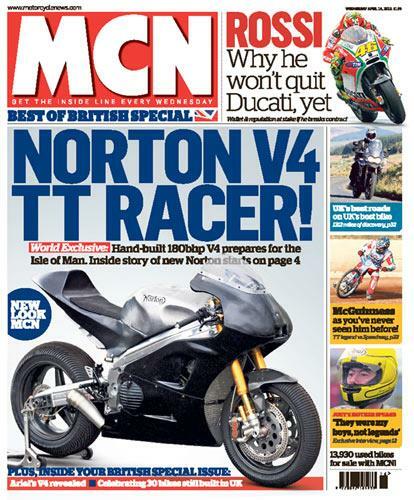 The Norton V4 is being unveiled to the world this morning at the TT press launch on the Isle of Man, but inside this week’s MCN we’ve got the exclusive inside story of how the bike was born. The new bike features an all-new Spondon twin-spar aluminium chassis, factory Ohlins suspension front and rear, carbon-fibre wheels and Brembo brakes. MCN’s editor Marc Potter was stood with his fingers in his ears as the Aprilia-powered hand-built V4 was fired up for the first time at Norton’s Donington Park headquarters last week. He said: “The fact that Norton has built this bike from the ground-up so quickly is incredible, the fact they are going to race it at the Isle of Man TT in 37 days time is unbelievable. But if you’ve ever met Norton boss Stuart Garner you’ll know that around him anything is possible." Read our exclusive five-page Norton V4 story, inside information on the new bike and an interview with Norton boss Stuart Garner in the April 18th issue on sale now.